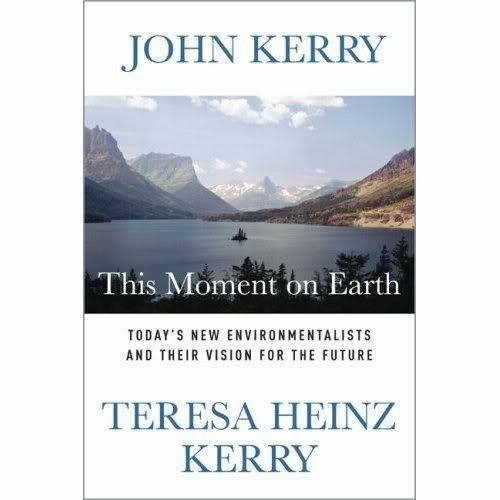 The title of this post is a play on the title of John and Teresa Kerry's new book, This Moment on Earth--a treatise on the nature of the modern environmentalist movement. 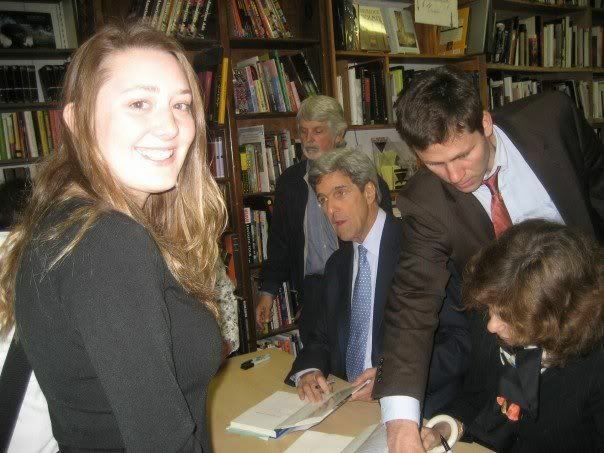 As I mentioned in my diary on Tuesday, Senator Kerry was in the Los Angeles area yesterday at a bookstore in Brentwood as part of his book tour. The event was held in the outdoor courtyard at Dutton's Brentwood--you can follow the link to see a picture of the courtyard in question. It was a little more than slightly chilly--John remarked that we were such a welcoming crowd that we had even managed to bring Boston weather out to Los Angeles to meet him. And despite the weather, it was indeed a warm welcome--everyone was surprised by how many people came out to see the Senator and Teresa speak. The entire courtyard area was packed, and people were sitting on both sets of stairs and standing on the upper balconies as well. It was exciting to see that type of turnout--I'm hoping it bodes well for the future of the movement. Senator Kerry began by giving an exegesis of sorts on the problems, solutions and principles contained in the book, weaving a narrative filled with facts, humor and passion. It's worth noting that his initial presentation included so much scientific data and information about CO2 levels, melt rates, positive feedback cycles, peer-reviewed publications (986 of them, to be exact!) that I began to wonder whether I was listening to the 2004 Democratic nominee or the 2000 Democratic nominee. On that note, it's worth pointing out that Kerry teamed with Al Gore to hold the first Senate hearings on climate change back in the 80s. My memory may be faulty--it's certainly not photographic--but I don't really remember anything groundbreaking in the Senator's speech--just a affirmation of the dire need for reform of our nation's environmental and energy policies, and a reaffirmation of the fact that we have the capability to do something about it just as long as we have the political will. Perhaps others who attended--such as SusanG or Kevin in Long Beach--can weigh in on particular points I might have overlooked. Before taking questions, John turned the mic over to Teresa, who spoke on environmental issues relating more to women. This included what was probably one of the more humorous (and informative!) moments of the evening--a discursus on disposable diapers! Seriously, I had no idea that "disposable" diapers took 500 years to make good on their commitment to biodegradability. After Teresa spoke, members of the audience got to ask questions--and though the preferred topic was environmental issues, the questioners also touched on Iraq, immigration, and a host of other issues and current events--lots of which ended up boiling down, in essence, to environmental and energy policy. From murphy in the comments on my DailyKos diary: Kerry was asked who he was leaning toward in the 2008 primary, and said that he didn't know yet because none of the candidates had come out as strongly on environmental issues as he would like. 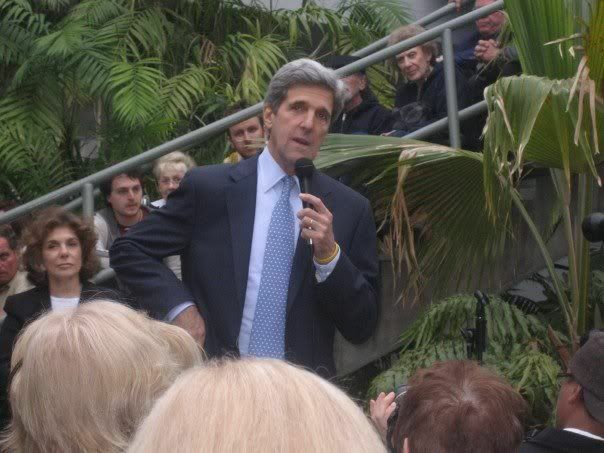 But by far my favorite part of the evening was actually talking to the Senator Kerry in the signing line! If you read my diary on Tuesday, you can see that I asked him whether he had heard of Energize America, and he sounded interested. Well, I brought some materials about Energize America with me including some background information about the Neighborhood Power Act, one of EA2020's signature legislative ideas, and gave them to the Senator--and he turned to his aide and said, "put these with my papers--and make sure I have it!" I think that was my first time ever lobbying a sitting Senator or Congressman, and I definitely hope I can repeat the experience. This little personal experience also wouldn't be complete without mentioning my girlfriend Andi, who came with me--she has been a lifelong environmentalist and was a supporter of Kerry back in the 2004 primary because she found his environmental record so appealing. And because I told her that I thought the event would be inside so she probably wouldn't need a jacket, she spent a good deal of time shivering...but she thought it was worth it! If there were any other Kossacks there beyond the ones I've mentioned, please speak up and state your opinions! 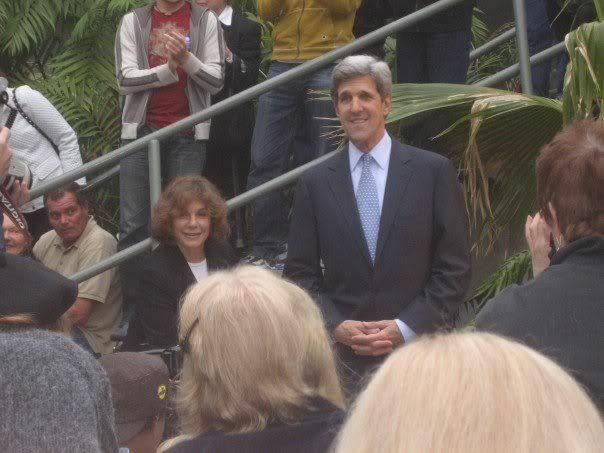 Like I wrote in my earlier diary, I had no idea until now that Kerry was such a strong leader on environmental issues. Seeing his level of conviction makes me all the more happy that we have people like him and Senator Boxer heading up our Senate committees rather than Senator Inhofe. Elections have consequences, so let's keep winning! Earlier this evening I joined with a few other Los Angeles area bloggers in a conference call with Senator Kerry. Also on the call was SteveAudio, Pamela Leavey of The Democratic Daily (and kerrygoddess on DailyKos), and last but not least, DailyKos frontpage editor SusanG. Below is are some rough notes of the questions we asked, and some rough notes of the Senator's comments. The conversation focused chiefly on environmental issues, as that is the nature of the book, but we did touch slightly on Iraq and foreign policy. Opening remarks: The book is a broad effort by Teresa and me to try to focus on a lifetime of effort on the environment, and focus people’s energy on how and why the grassroots of America is ahead of Washington, and why there’s urgency on not only global climate change, but also air quality, water quality, toxins, food, air and water—a moment where we have to decide whether we’re going to make responsible choices about the future, or capitulate to a series of tipping points—fisheries, pesticides, chemicals and so forth. This is as critical a moment for the environment as the original earth day in 1970. The book is about how individuals in America are taking initiative to hold the government accountable. SteveAudio: The EPA is refusing to discuss the melamine-infected wheat gluten, and the Endangered Species act. Hekebolos: Regarding the Mass. v. EPA decision—where does this go from here? Kerry: Mass and Cali are now free to do what they want. Kerry wants to proceed forward on these issues in the Senate and the Commerce committee efforts. We’ll try to set a standard—require people to push the technology curve, and respond to the urgent demands of global climate change. SusanG: There’s a lot of pressure from corporations for this deregulation. I’m puzzled about the human nature that would allow them to continue these deregulation patterns. Do they think that their families are exempt from the things occurring in their own bodies? Kerry: I think that a lot of them haven’t had time to look at the facts and the issues, and also, a lot of them are forced into thinking about the short term because that’s the way Wall Street has worked. It’s not always the way it works, because there are exceptions. There’s a “quarterly report” short-term syndrome that’s infected a lot of corporate leaders, and lots of them are just not aware. It’s not as conspiratorial as people think, but it’s definitely negligent. And there are corporations that are exercising responsibility. The Climate Change Action Partnership has Dow, GE, IBM, BP, Layman Brothers—they’re exerting enormous leadership, and showing people that it’s good business and good bottom line to engage in energy efficiencies and adopt different practices. They’ve all reduced emissions voluntarily and found that they’re saving money as a consequence. Part of the purpose of the book is—chapter 7 and 6—the conclusion, there’s a lot of money to be made, wealth to be created. The environmentalists have been fringed by a myopic group that has said that they care more about a snail than a job—and that’s a false straw man presentation. But in fact, responding to these things that we’re promoting are in fact, job-creating and increases health and tens of thousands of jobs. China will confront this issue headlong of how it provides for its power demand without killing everyone through pollution, and that requires them not building one pulverized coal plant, and the only way to do that is embrace carbon sequestration and clean coal technologies. What we used to think of as a two-fer, this is a five-fer, and minimum. You do one good thing and you get 5 benefits out of it. Reduce hospital visit, create jobs, improve American security, expand your tax base. All of these things happen as a consequence of tackling these issues, and the real test here—and this is in the book—if we’re wrong after 928 peer-reviewed studies each of which documents that human activity is creating this—then even at that, the worst that can happen is you still get all those other benefits. But if they’re wrong—if Jim Inhofe and the flat-earthers are wrong—the worst that happens is absolute global catastrophe. So which side of the ledger do you want to be on? 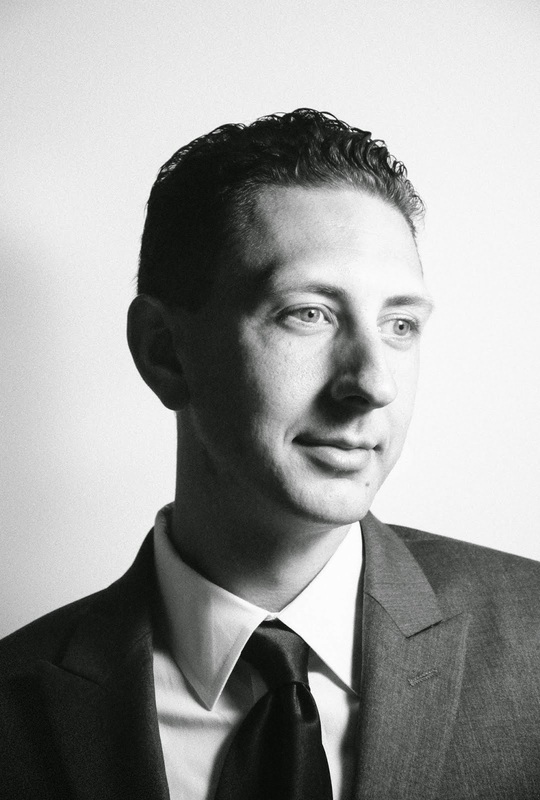 Hekebolos: have you heard of Energize America 2020, the netroots-built energy policy platform? Kerry: No, but I think it’s a fascinating idea. It’s a wonderful, welcome development and it just goes to show how the grassroots and the blogosphere are ahead of Washington on these issues. I'm looking forward to see it, and we’ll try to incorporate them in the finance committee and commerce committee. SteveAudio: There’s a growing movement to encourage you and your colleagues to just say “go screw yourself” to Bush if he vetoes the funding, and not send any more supplemental bills to his desk. Does that have political merit? Kerry: We have to find a legitimate mechanism to end the war. I joined with Russ Feingold. This confrontation is good, healthy. His simplistic exploitation of the issue is exactly what’s gotten us into this hole. He hasn’t dealt with the realities of how this will be resolved. Kissinger just said there’s no military solution. So in that case, where’s the diplomatic and political solution. And that’s what we need, and that’s what will support the troops and address American interests at the same time. As for my own personal commentary--I previously hadn't been aware of Senator Kerry's commitment to environmental issues, but I am a lot more aware now. My girlfriend is an environmentalist, and she told me no more than a couple of days ago that when she was making her decision on whom to support in the 2004 primary, she took a look at the environmental platforms of all the candidates and Senator Kerry was by far her favorite. I also continue to appreciate Senator Kerry's efforts to reach out to bloggers and activists on these issues, even though he's not seeking any higher office than the one he currently possesses. I will be attending the booksigning tomorrow and will post a report and perhaps some photos from that event.